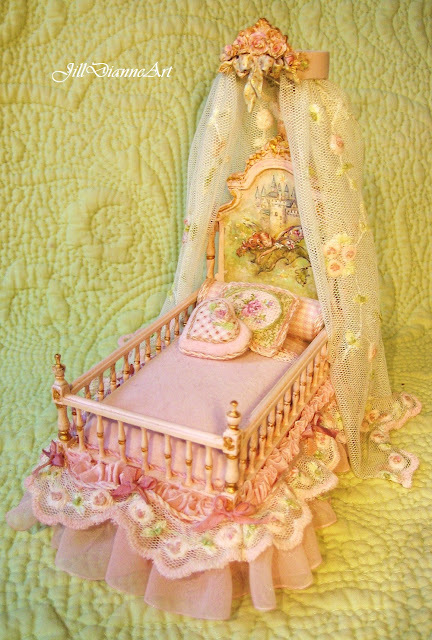 Hand-painted Pink Sleeping Fairy Bed with hand-sculpting and embroidery. 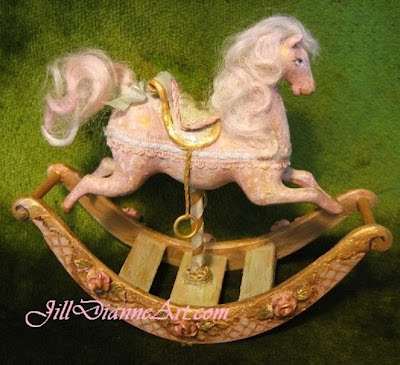 From the collection of Aubrienne Krysiewicz-Bell. 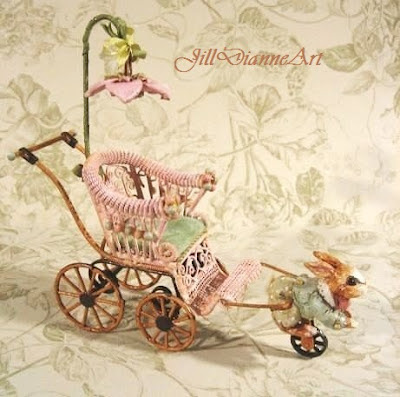 Pink Mechanical Fairy Buggy with embroidered throw. From the collection of Annette Parenti. 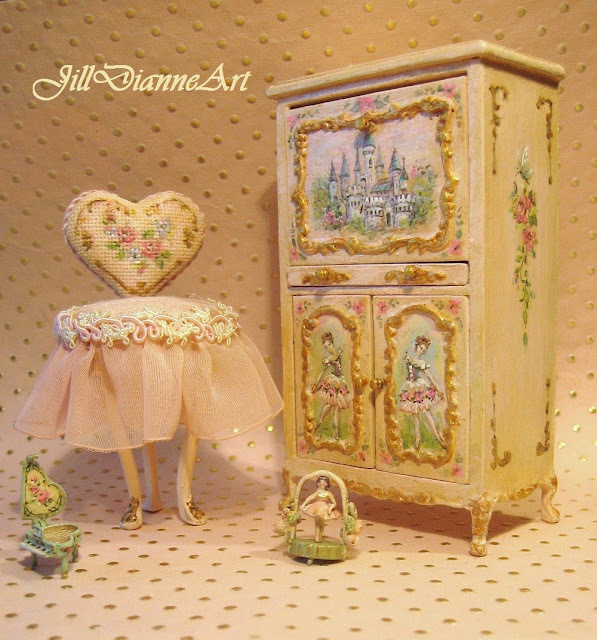 Tapestry and Tutu Ballerina Chair with a Fairytale Castle/Ballerina Escritoire. From the collection of Anne Quirk. Tiny Fawn Ballerina Marionette or Jointed Doll. 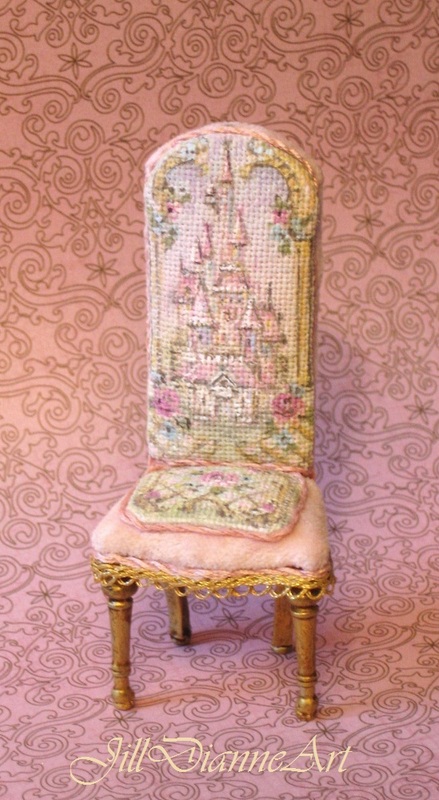 Child-sized Tapestry Painted Chair with Pink Velveteen. 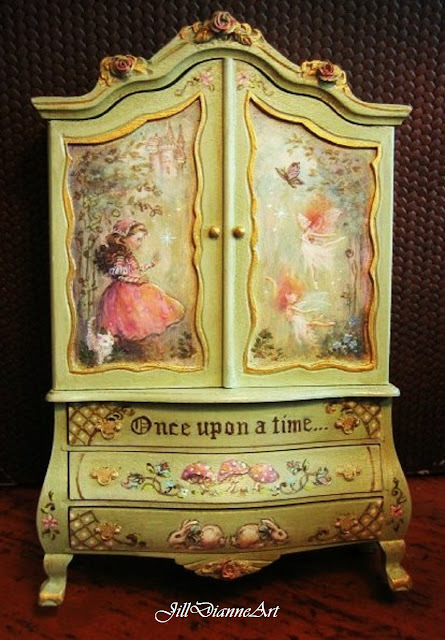 From the collection of Nancy Reilly's Girls. Hand-sculpted and carved Pink Rocking Horse with Pink Curly Kid mohair mane and tail. 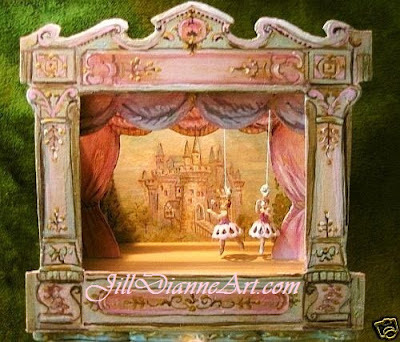 Victorian Tabletop Theatre with Mechanical Ballerinas. 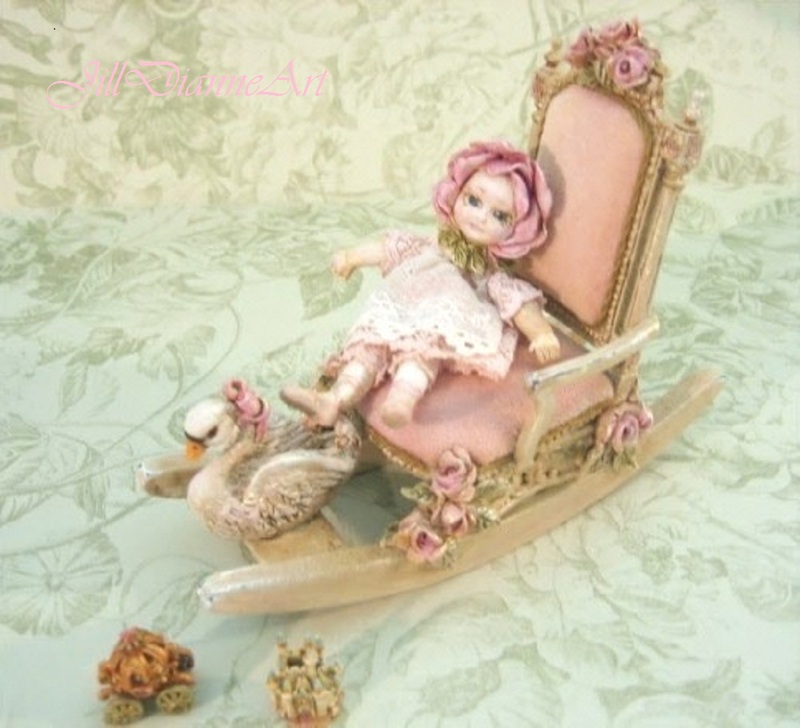 Rocking Swan Boat with sculpted roses, swan and Little Rose Bonnethead. Hand-painted Little Red Riding Hood on a Vintage Armoire. From the collection of Laura Reif. 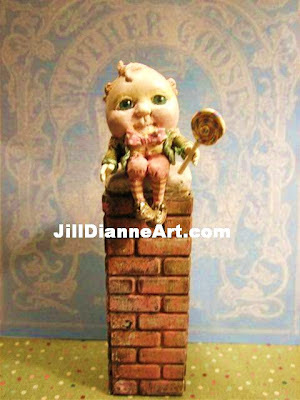 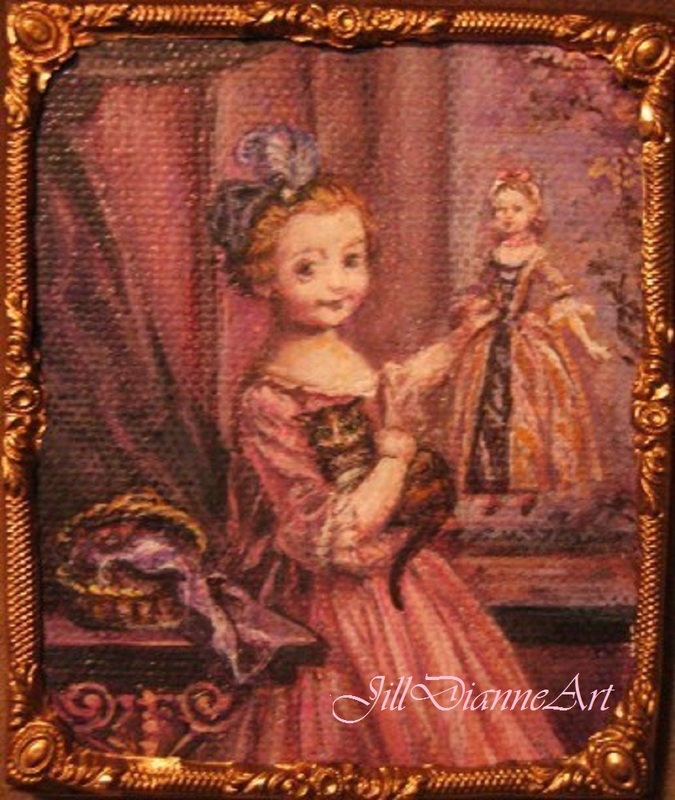 Jill Dianne 18th Century Humpty on the cover of Dollhouse Miniatures Magazine. 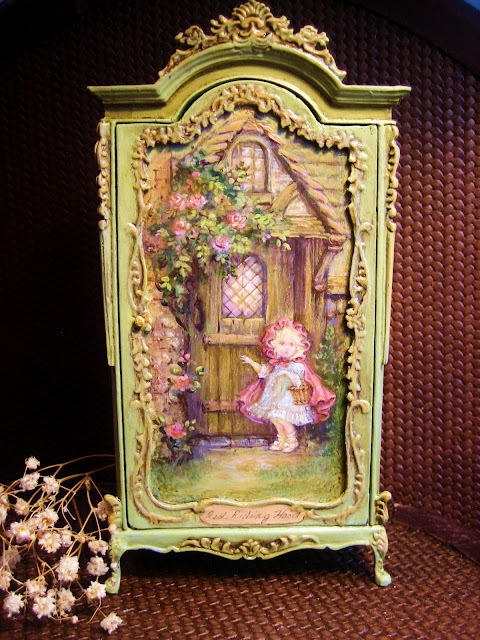 Finding Fairies Cupboard from the collection of Elizabeth McBride. 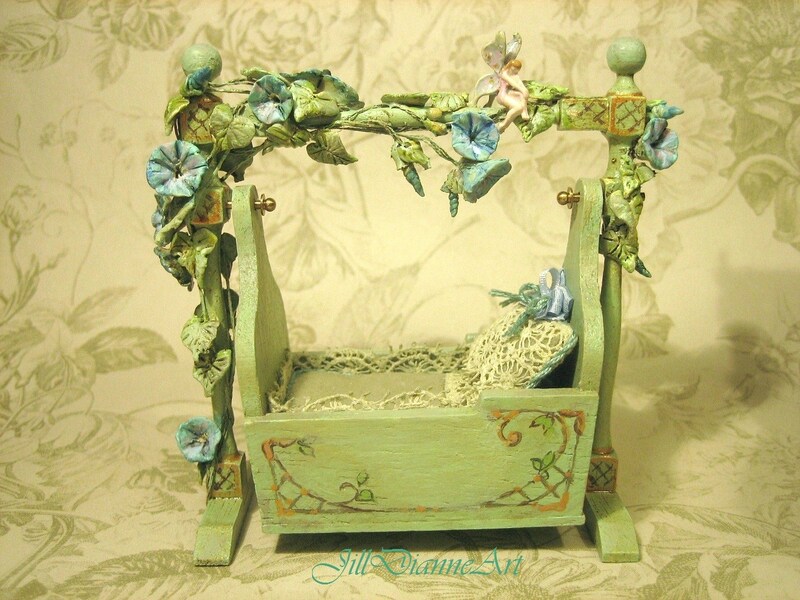 Sculpted Morning Glory Cradle with tiny painted silver fairy. From the collection of Catherine Russell. 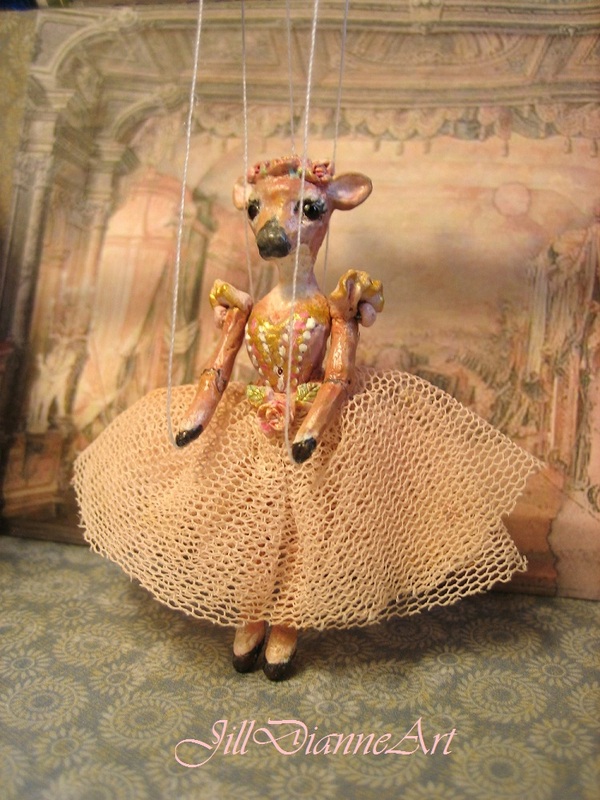 Mechanical Toys from the collection of Aubrienne Krysiewicz-Bell. Antique-style Mechanical Carnival Toys from the collection of Karin Wilkinson. 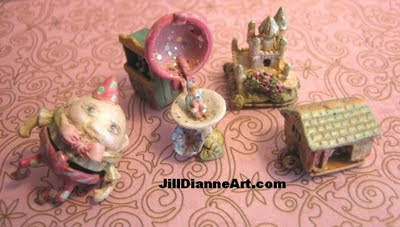 From the collection of Diana Laubenstein. 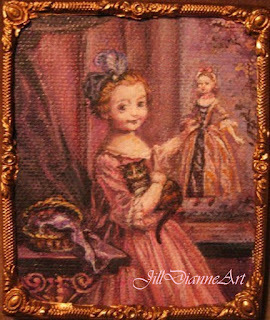 Miniature reproduction of painting from the 1700's...original painter unknown. 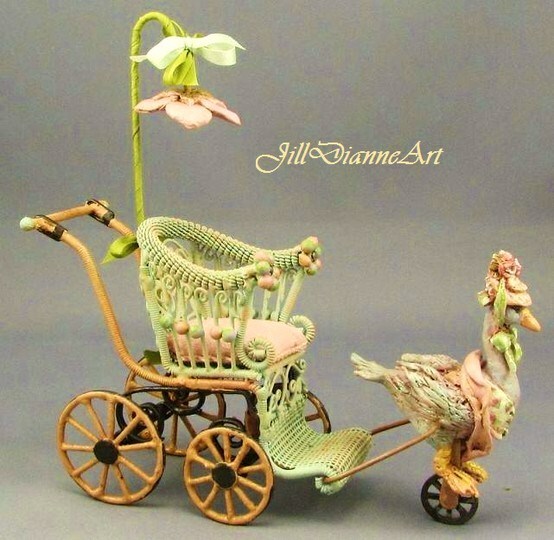 From the collection of Karin Wilkinson. 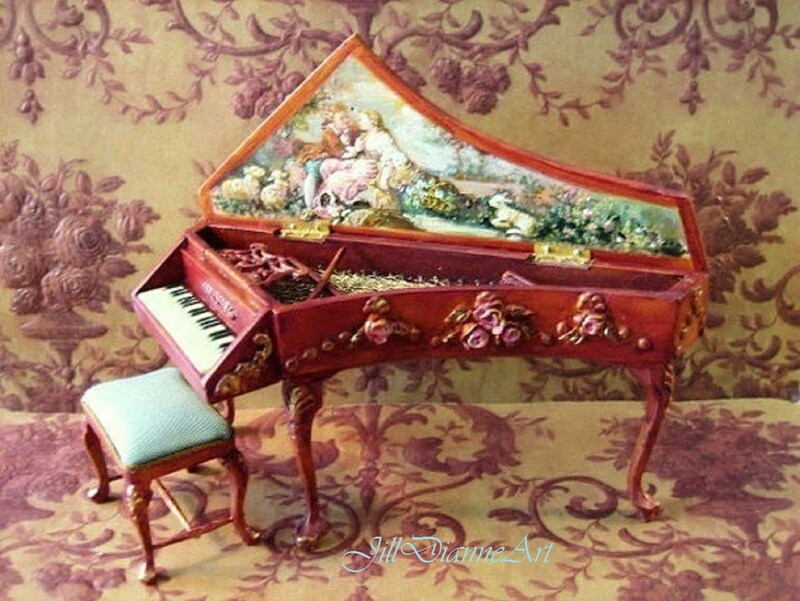 Petite Harpsichord with miniature reproduction of Francois Boucher's Pastoral Scene. 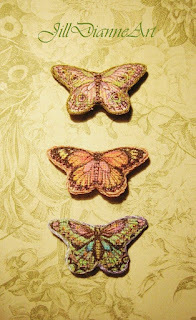 I am in awe and filled with wonder and admiration! 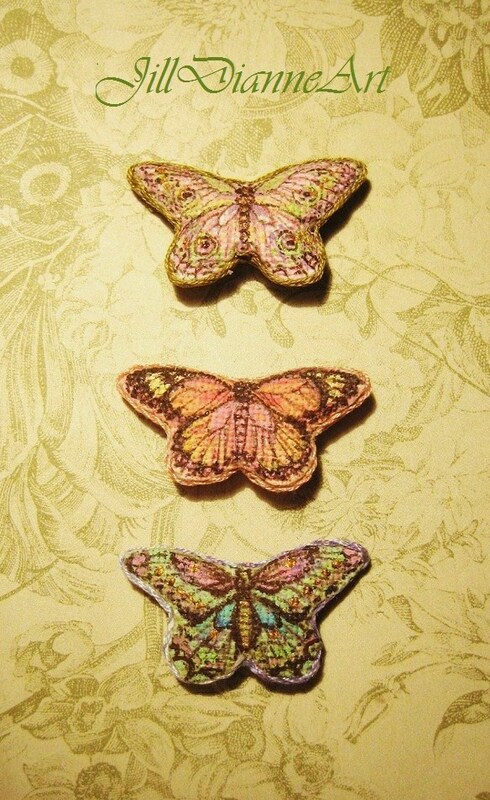 Your work is many dreams come true!